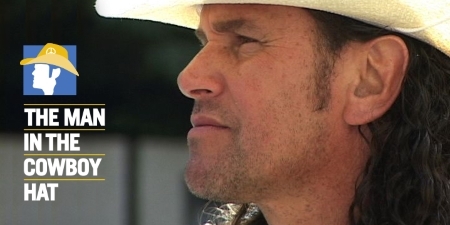 More than a decade ago, filmmaker Janice Rogovin embarked on a documentary project about Carlos Arredondo, a grieving man dealing with personal tragedy. Little did she know that his story would someday intertwine with a national tragedy, as he became one of the most recognizable heroes from the 2013 Boston Marathon bombing. The filmmaker will premiere her film at the Boston Public Library on Saturday March 25, 2 PM. Here, she discusses the film’s origins, its twists and turns, and her own path as a documentary film artist. ArtSake: Can you talk about the trajectory of The Man in the Cowboy Hat – its origins and its journey since its inception? Janice: The origin was a news item I heard on the radio in 2004. It said that when Marines informed a father that his son had been killed in Iraq, he got inside the Marines’ van with gasoline and a propane torch and set the van on fire. The man survived with 2nd and 3rd degree burns on his body. The announcer said that no one knew if the action was a protest against the war, a suicide attempt – or what the motive was. When I heard this, I thought it made total sense that a father would be so outraged as to have such a reaction. What could be worse than losing your child in a war whose motivation, at that point, was questionable at best? The van burning event happened in Florida but it turned out that the man, Carlos Arredondo, used to live in Jamaica Plain, where I’ve lived for many years. I was determined to find him, but it took some time. It wasn’t until the following summer, when I was in the local bike shop picking up my newly tuned bike for Fourth of July weekend, that the bike mechanic, and I got on the subject of independence and the Iraq War and I mentioned the man who had burned the van. It turned out that the bike mechanic was the man’s cousin, both having emigrated from Costa Rica! The following month I attended a gathering at Carlos’s house in Roslindale for the first anniversary of Alex’s death, which happens to be the same day as Carlos’s birthday. I started making a film about Carlos’s reaction to his son’s death, but continued following his story as things in his life – both public and personal – kept happening. I never thought when I began the film that Carlos would end up being invited to attend the State of the Union address! As a documentary filmmaker, I went with the flow of events and my intuition. There was a time when I was the only filmmaker traveling with Carlos on his quest to honor Alex and keep his memory alive. Then, there was a time after the Marathon bombing when the entire media world was at his doorstep. Carlos always stayed in touch with me, but for a while there were restraints on filming due to publication agreements he made with other outlets. ArtSake: What drew you to Carlos Arredondo, as a subject? Janice: Once I met Carlos I was deeply moved by his story of growing up in Costa Rica during the Kennedy era loving the USA, leaving his homeland for the American Dream and then having to come to terms with losing Alex in Iraq. Carlos speaks from the heart. He is charismatic and sincere. I was also impressed by the impact of the shrines that he created to honor Alex and to keep his memory alive. The first time I went to his house, as I walked down the street looking for the address, I was stunned to see a white picket fence completely outlined by small American flags blowing in the wind. Through the gate, on the inside of the fence, were different layers of artifacts arranged around a central cross – a chipped, ceramic angel playing the flute, a Marine baseball hat, a rabbit-shaped planter – that evoked the feeling of a life lost. Again, I was deeply moved by the energy and effort put into the memorial display. As Carlos got involved in peace organizations, his memorials to Alex became more public. He was angry at the government’s ban on news coverage of soldiers’ coffins coming home. It should be up to families to decide if they want media coverage or not, he said. In protest, he installed a coffin covered with an American flag in the back of his pick-up truck and drove to peace demonstrations all over the country. When President Obama took office and lifted the ban, Carlos put the coffin away. I would ask Carlos to explain the design and purpose of his installations to make sure that I understood what he was trying to say. And his thinking made sense to me. ArtSake: Can you talk about the challenges – and perhaps the rewards – of a filmmaking project spanning more than 10 years? Janice: A ten year filmmaking project produces a lot of footage! Logging and transcribing are very time consuming. Then there is the biggest challenge of deciding which threads of the story to follow and which to let go. It’s important to be clear about what you want your film to be about, and focus the contents accordingly. With this story in particular, there were very surprising twists and turns – some public, some personal – that changed the tenor of the story. We had to make big adjustments emotionally, and from an editorial viewpoint, because of the events that occurred over time. Over the years I got to know Carlos pretty well. I got to know his mother, Luz, who I like very much. I feel good about the direction we took with the film. From a technical point of view, when I started the film in 2005, most independent documentary filmmakers were still using Standard Definition (SD) video cameras. Over the next few years that changed, so that by 2008 or so, everyone was using High Definition (HD). I did not make the switch over to HD partly because it seemed technically overwhelming to me and partly because of the additional expense. Plus there would have been the complication of having half the film shot half in SD and half in HD. So I got caught in a technology shift. ArtSake: How does your background in still photography impact your filmmaking? Janice: I started doing film because when I used to do still photography and oral histories, I began to regret losing the expression in people’s voices and their gestures as they spoke. The first film I did in graduate school at Mass Art had people talking and gesturing in an interesting way in a specific setting, and worked well as a film within those confines. Of course, there is a lot more to filmmaking outside of those confines! My sense of pacing is somewhat slower than what is generally expected in films. I tend to notice framing quite a lot – what will appear in the background and on the edges of a shot. ArtSake: What other artists, in film or otherwise, interest and inspire you? Janice: One is Frederick Wiseman, a documentary filmmaker who lets the subject speak for itself, except by the way he edits and sequences. Susan Meiselas is another, a documentary photographer who gets back in touch with subjects she photographs or maintains relationships with them. She photographed the Revolution in Nicaragua in 1978-1979 in what has become a classic collection. She’s returned several times to contact those she’d photographed, interview them and/or work with them on a “collective memory” project. ArtSake: What are you working on next? Janice: I have several ideas for film and book projects but don’t want to share them at this point. They are still percolating. But I will be teaching pinhole photography in science classes at a Boston public high school this spring, something I enjoy doing very much! Janice Rogovin is a documentary photographer, filmmaker, and teaching artist based in Boston. She has been the recipient of a National Endowment for the Arts Emerging Artist Award, two Massachusetts Artist Fellowships (in 1985 and 1995), and three project grants from the Massachusetts Humanities Foundation. Her books A Sense of Place/Tu Barrio and Let Me Tell You Where I’ve Been, Photographs and Interviews with Seven Vietnam Veterans, are in the collection of the Museum of Modern Art, New York.